From the loved author of The Sacred Diary series comes a mysterious and engaging novel about healing and our own shadows. Want an allegorical novel tells powerful truths in an imaginative way? Adrian Plass returns with a new, allegorical novel for fans of The Shack. It's a good read, and an accessible way into an often ignored subject that will leave you with an emboldened spirit and belief that God heals today. What if there was a Doctor you could go to when on other would take your case? A Doctor who didn't need x-rays to see inside of you and know what the problem was? And whose prescriptions aren't pills, but genuine healing? For those hurt by the past, and whose scars, though not on the skin, are just as damaging, have kept them from a healthy and happy life, he's the doctor of choice. His methods are unlike any others; they're surprising, and they're effective. He cures the dark spots of your life. But what about the Shadow Doctor himself? Like anyone, he torments, troubles, and demons which plague his mind. Healing people is all that keeps him from drowning inside himself, so how does this Doctor heal himself? Waging the war between his own illness, and the afflictions of those that come to him for healing, is there another way to be made whole again? From Adrian Plass, the loved and trusted author of The Secret Diary of Adrian Plass, Seriously Funny, and many more, The Shadow Doctor an imaginative and unique allegorical novel that explores where we turn when we are in need of healing. The Shadow Doctor by Adrian Plass was published by Hodder & Stoughton in February 2017 and is our 1333rd best seller. The ISBN for The Shadow Doctor is 9781444745474. The most wonderful thought pro voking book ever ,a book you cannot put down once you start reading it. absolutely marvellous. Lovely surprise for an Adrian Plass fan. Bought as a present which I'm sure will be read with enthusiasm. Arrived day after ordering so I'm well pleased. Take a peek at some articles related to The Shadow Doctor. Got a question? No problem! Just click here to ask us about The Shadow Doctor. The Shadow Doctor works in the local doctor's surgery just like any other medic - but his role is a little different to that of his colleagues. This man can see into your soul, and the cures he prescribes don't come from the pharmacy. If you have fears you just cannot face, wounds you can't even bear to remember - if you've been abused, ignored, damaged by all life throws at you - the Shadow Doctor is here to help. But the Shadow Doctor has shades of his own, and the work of helping others may be the only thing keeping him afloat. Can he stay ahead of the demons that torment him long enough to help those who need him? It took me 3 attempts to read The Shack. Don't get me wrong, I found it very powerful when I did eventually finish it, but I've never put down and picked back up a book as much. So I chose Adrian Plass' allegorical fiction The Shadow Doctor a little apprehensively, knowing that I had to finish it in a month or less. However, I am happy to say The Shadow Doctor is an easier read. While it deals with similar themes to The Shack: darkness, healing, distance from God. There is a lightheartedness that feels less like wading in mud. The characters are people I instantly recognised from my day-to-day life. A slightly kooky grandma who adores her grandson but also recognises his flaws and limitations. The Shadow Doctor who is in equal parts magnetising and mesmerising as he is frustrating and elusive. Then of course, there's Jack. Jack works in ministry. Jack is a fully paid-up (sometimes literally) member of his Church. He's following all the rules. He doesn't really drink, he tithes his 10% as soon as he receives any sort of income. He never misses an opportunity to mention God in a conversation, just in case. He can't see any grey area when it comes to right and wrong. And of course, he ministers to those around them, providing them with prayer, comfort and answers. Why then does his Grandma not seem interested in his great passion? And Why does God feel so distant? It's a tale that many will recognise and perhaps relate to. Yet through the words of the doc (who, by the way, doesn't exactly have it all figured out himself) and working alongside him, Jack begins to glimpse God in the mundane. He begins to see every interaction, with every person as very important and comes to understand that God is perhaps not caught up in the rules and regulations set forth by a Church council, but instead he can be found in vulnerability, service and everyday interactions. Adrian Plass writes with an raw astuteness, bringing in aspects of poetry, his previous work and other works of fiction (there is a stunning extract from C.S. Lewis' The Silver Chair which made me quite emotional). 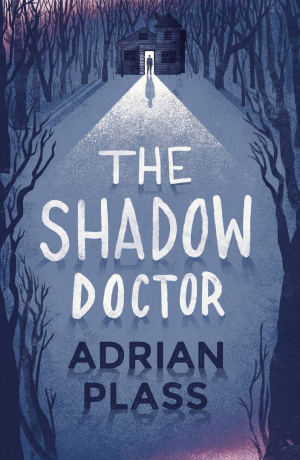 His work is down-to-earth and relatable, so reading The Shadow Doctor feels like a healing chat with a friend where situations you hadn't quite admitted to, come to the forefront to be dealt with delicately.